Fool's Gold was originally formed in Los Angeles by Lewis Pesacov and Luke Top as a large open-ended collective, at times ranging between 12-15 members. After many tours following the release of their self-titled debut album (2009), the once sizeable collective organically evolved into a tight-knit five-member "Band," featuring vocalist/bassist Luke Top, guitarist Lewis Pesacov, drummer Garrett Ray, multi-instrumentalist Brad Caulkins, and percussionist Salvador Placencia. Confident, focused and much more personal, this new line-up allowed for the dynamic of the group to blossom, redefining and sculpting their sound for the sophomore LP: Leave No Trace. 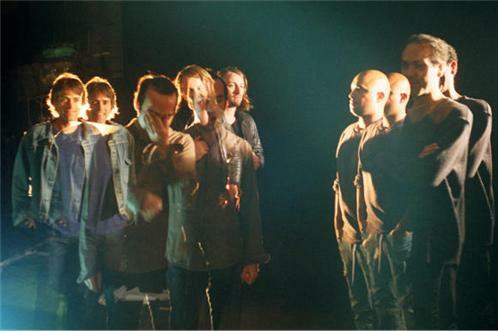 Fool's Gold's debut record garnered them a record of the year nomination from NPR, a Best Record of 2009 honorable mention at Pitchfork and was in the top 50 of UNCUT's "Best Albums" of the year. They received 5 star reviews in the UK Guardian and The London Times as well as features in the Village Voice, LA Times, SF Weekly and Guitar Player. They recorded live radio sessions for France Inter's "Black Sessions," KCRW's "Morning Becomes Eclectic" and their song, "Nadine," is the theme song for "The Madeleine Brand Show." Last year their fiery live shows earned them invitations to both The Hollywood Bowl and The Summerstage in Central Park NYC. In 2011 they will be headline a US and European tour that will include, amongst many others, stops at The Glastonbury, ACL and Solidays Festivals.